In a post two years ago, on the English pub at the 1964 New York World’s Fair, I noted that Watney’s Red Barrel Beer was on the menu. It was perhaps the first appearance in the U.S., unless small amounts were imported earlier. For the beer to be showcased by the U.K. at its pavilion at a prestigious international exposition was an imprimatur par excellence. The brand originated in England in 1931, as numerous beer histories attest. Watney Combe Reid had conducted research to devise a beer whose stability would permit reliable export to India. Stability for this purpose meant heat-pasteurized, filtered, and force-carbonated. In essence, it was a modern bottled ale in a large sealed can, later known as a “keg”. This beer was quite different from traditional, draught “real ale” which was live, unfiltered, and unpasteurized. The 1930s seem late for a focus on the India market, and we don’t know if Red Barrel ever irrigated the last days of the Raj. It did appear in Australia in the 1950s, as a Christmas advertisement shows in Sydney’s The Sun in 1952. From 1964 (at least) in the United States, Red Barrel was on the market for approximately 30 years in bottle and draft. This 1966 ad in East Hampton, NY proudly advertises draft Red Barrel and gilds it as England’s oldest draught beer. Red Barrel was always regarded here as prime quality beer. One index is its price. According to this 1984 article in the Washington Post vaunting the virtues of imported beers Red Barrel was priced the same as Fuller’s London Pride and Charles Wells Bombardier Ale, both still going strong of course. Only Samuel Smith Brown Ale and Orval Trappist Ale, both new-generation imports with a craft-like cachet, fetched more money. In 1980, an ad in Ithaca, NY had Red Barrel at $5.99/6 pack, a dollar more than (imported) Bass Pale Ale. In 1988 a case of Red Barrel, among a group of nine beers offered including imports such as Molson and St. Pauli Girl, was $16.49 a case in the summer season, the most expensive of all beers listed. American beer needless to say was much cheaper. The Post in the 1984 article was complimentary but perhaps nuanced, calling Red Barrel “smoother” than London Pride and, oddly enough, somewhat “American” in character. This was probably due to its malt adjunct or sugar component, which lessens malt sweetness and body. James Robertson in his The Connoisseur’s Guide to Beer (1978, 1982) noted a “sour” element in Red Barrel – the same adjunct at work, likely. Robertson regularly used the term sour to describe inexpensive American brews. While nonplussed by the bottle, which scored relatively low in his taste score tallies for imported beers, he considered the draft “a much better product”. John Porter, in the 1975 book All About Beer, included Red Barrel among his four picks for best imported English brews. The others were Watney’s Stingo Ale, Mackeson Stout, and Whitbread Ale. As a reasonable sampling of contemporary U.S. critical opinion, the beer was obviously in general well-regarded. As to general consumer reaction, Red Barrel was certainly a star performer. In 1971, a non-blind beer tasting conducted by New York Magazine placed it third out of 57 brews. First place went to a dark version of German Wurzburger, and fourth to Dutch Heineken. Second was an obscure French brand. In 1982 Frederick Carpenter of Bethel, Connecticut, of Anglo-American ancestry and a dedicated Anglophile, threw a party to honour the traditions of St. George. What beer did he lay in? A keg of Watney’s Red Barrel. The story is interesting on numerous accounts, you can read it here. Consumers were encouraged in this perception by commercial practices such as Red Barrel being flagship beer at the English-themed Lord Hardwicke pubs. This c.1970 venture was sponsored in part by a British lord. 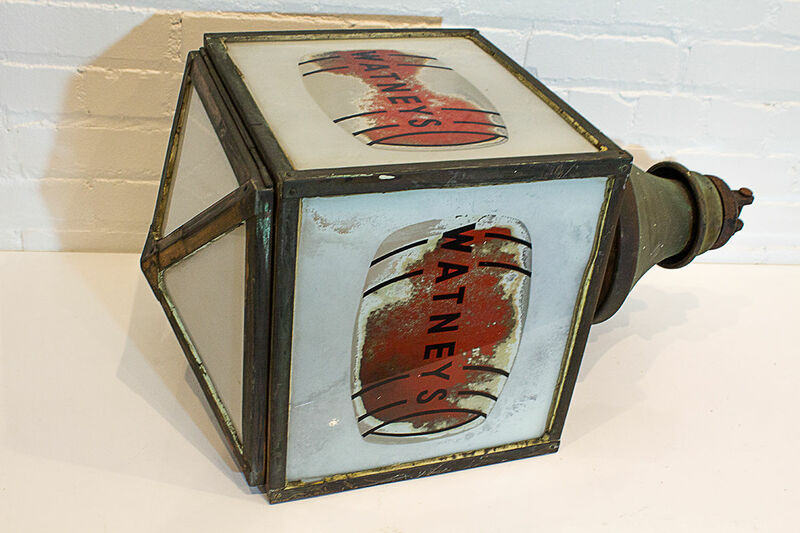 See my posting the other day on Hardwicke’s pubs..
By the early 1990s Sleeman Brewery in Ontario, an early craft brewer, acquired rights to Watney’s Red Barrel, presumably for export to the U.S. as it was never sold in Ontario. Perhaps a plan to sell it here had fallen through. Commentary in recent years suggests the Sleeman version was a lager, which is plausible. I was given a bottle on a visit to Sleeman’s and recall it being bland. 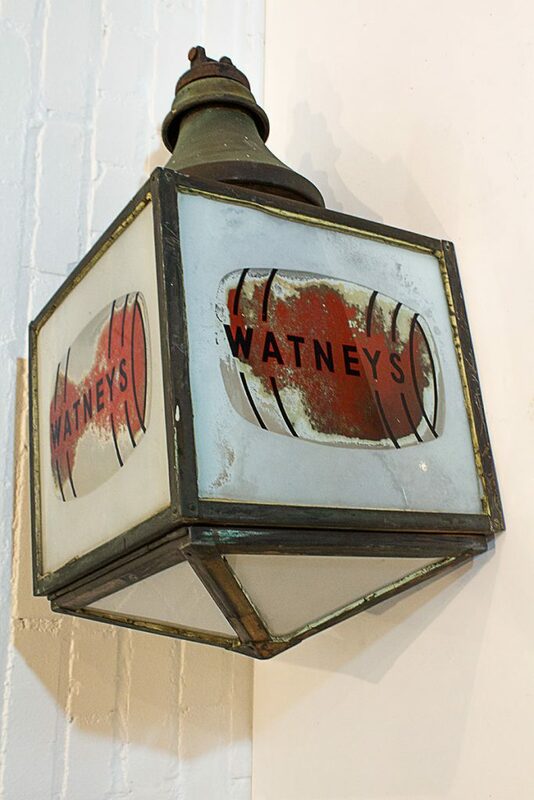 The English-made bottles and draft, brewed (at least) at Stag Brewery, Mortlake and later Usher’s, a Watney’s-Grand Met unit, were ale and superior in taste. But they weren’t real ale. Anyway, by 1994 Watney’s was ending its presence on U.S. beer shelves. Now, how strong was this once sought-after import? It was surprisingly hard to find out as bottle labels did not state it. Boak and Bailey’s recent article on U.K. Red Barrel history suggests the domestic brew was c.3.8% ABV, and somewhat higher for earlier bottlings. To put this in context, 4% ABV was and is the norm for mass-market North American light beer. Still, sedulous research has pulled up the number for imported Red Barrel in 1987: 3.92% ABV. It is from an analysis of beers and ales conducted by the Excise Tax Division of the Department of Revenue Services of Connecticut. I was rather shocked to see how low. It is 4% ABV for practical purposes, but still. Whether this was the revised 1971 “Red” recipe or the earlier, c.90% malt recipe, I can’t say. I’d guess the former since, as stated above, the Post (1984) called it “smooth” in comparison to London Pride, oddly (or not) the very term used by Watney to describe the revised 1971 recipe (see Boak and Bailey again), and thenceforth to be known simply as Watney’s Red. I’d think the new Red version was used for export too but the old name, Red Barrel, was still printed on bottles and tap clips. Now, 4% ABV can produce fine beer – after all Pilsner Urquell, a legend in brewing, is 4.4%. Still, in terms of best English traditions, it seems a bit low. But there you have it. My guess is the beer was probably somewhat like today’s Smithwick’s Irish Red, sweetish, with little hop aftertaste and a flattened note from adjunct. Or maybe like Rickard’s Red in Canada, a Molson-Coors product. Rebrewings of Red Barrel in Britain seem to have produced satisfactory impressions but nothing over the moon. Red Barrel was always what it was: an alleged but withal dubious improvement on traditional cask ale. It was designed by technologists who did not have the interests of beer purists in mind but rather, an overall goal to minimize product deterioration. Red seems to have been less bitter than Red Barrel to appeal to an expanded franchise who could not abide a beer with hop character. Abetted by some ill-advised advertising choices after 1970, the beer finally caught up with its contradictions. But it was a quality product in pre-craft America. There is no inconsistency here. Weiner, Porter, Robertson, the Post writer, the New Yorker magazine panel, etc. were not Pollyanna in their estimates. It is just that the standards of the day were quite different to today’s. A fair-to-middling performer at best in Britain – or FTM among the cognoscenti – Red Barrel had star quality here due to the U.S. competition being so much lesser. All that has been turned around due to the grit and doggedness of CAMRA and the North American craft trailblazers who took inspiration from its example. Note re images and quotation: image above was sourced from this online vending site, item is c.1935 and offered by the vendor of heritage furniture and decor mentioned in the listing. The quotation is from an online discussion forum that reproduced the 1987 Connecticut government study, as mentioned and linked in the text. All intellectual property in the sources used belongs solely to the lawful owners, as applicable. Material is used for educational and historical purposes. All feedback welcomed. *For Jim Roberston’s fuller remarks on Watney’s Red Barrel, see my comment printed under Boak and Bailey’s recent article on Red Barrel history, linked below. In the comment as well I link to a colour film from the 1960s showing Red Barrel in action at the bar. Here is the same 1987 Connecticut government analysis, with clearer formatting, from the site of brewery.org.